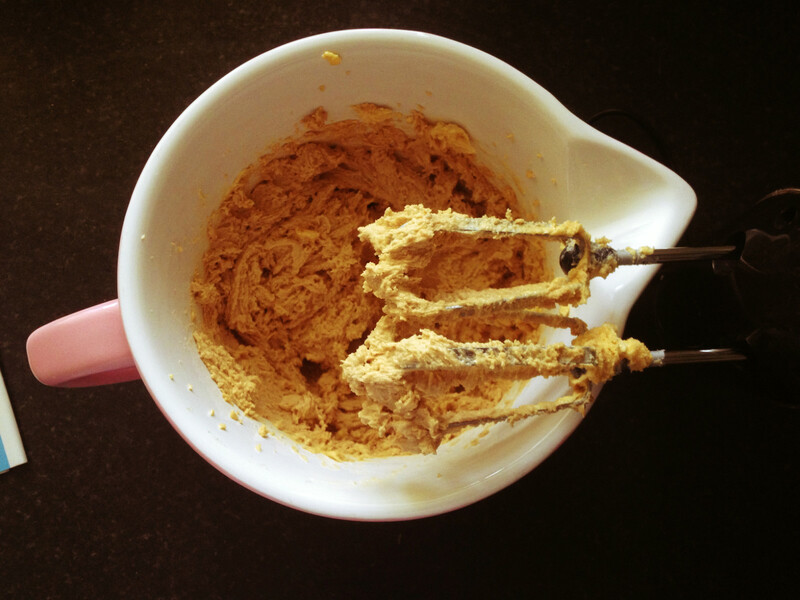 Finding a good cookie recipe always used to seem so hard! Never really being able to match the ones you might get in coffee shops and in the £1.50 packets you get in the fresh bakery isle in supermarkets but honestly this is the best cookie recipe by far that works every time for me and I highly recommend it! 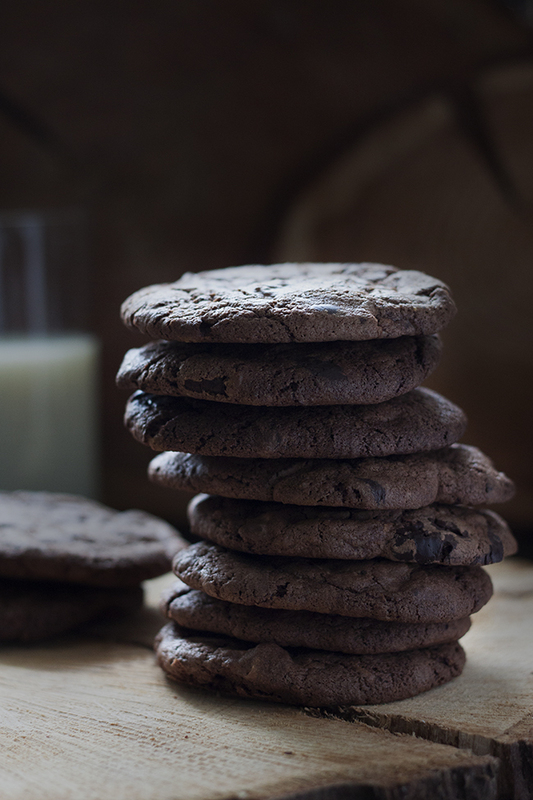 These American style cookies are chewy and soft, not to forget triple chocolate. Truly irresistible and just the recipe you’ve been looking for 😉 Give them a go and I’m sure all your friends will be impressed. 1. Preheat the oven to 190 oc or gas mark 5 and line two baking trays with greaseproof paper. 3. Once combined, add the egg and vanilla, mix well. Add the flour, salt, baking powder, bicarbonate of soda and cocoa powder – this should form a stiff dough. 4. Add the chocolate chips. I don’t tend to buy chocolate chips instead I use a chocolate bar! (cheaper and generally better quality!). 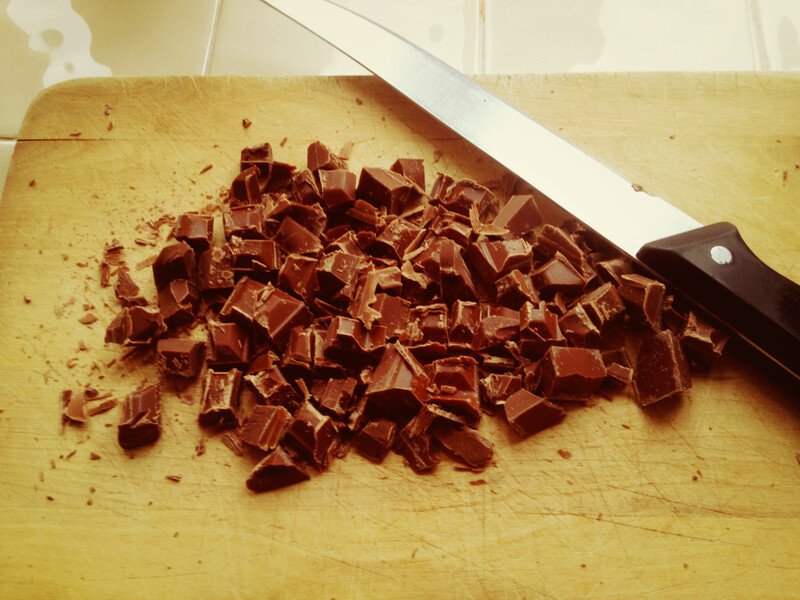 Just use a strong knife to chop the chocolate up in to little homemade chips. 5. Using a dessert spoon scoop up even balls of mixture, put them on the tray (fairly spaced apart) and press gently down using a fork. And that’s it! A super easy recipe! Bake them for around 10-12 minutes (they should be just starting to crack when you get them out). The cookies will seem soft but leave them to cool and they will be perfect :). Loved this recipe – very easy and tasted great. My daughter always clamours for big chocolate cookies from the supermarket but these are better (and I know what’s in them). Win,win! Hold the faith when you take them out of the oven – I was site they weren’t cooked but they were just right when they cooled down. Thanks for this recipe. They turned out just like a triple chocolate chip cookie should taste….perfect. Saved to my favourites! My 16 year old son said they’re the best I’ve ever made and I’ve made a lot!!! Thank you so much for the feedback! There delicious aren’t they, one cookie is never enough! My son’s girlfriend can’t have cows milk due to allergy, so I adapted this recipie by using dairy free chocolate, cocoa(green &blacks) soya milk , vita light (diary free) and the results were amazing! Thanks for the basic recipie, as my son’s girlfriend was very appreciative of her cookies. I reccomend less cocoa powder – or maybe I just used too much! Anyway, very good cookies, easy to make and yummy, but less cocoa. I found this recipe fantastic thanks so much it was amazing that I could even make them gluten free and they still turned out great 🙂 my family keeps nagging for more now lol! That’s great to hear!! I do absolutely adore these cookies! Haha.